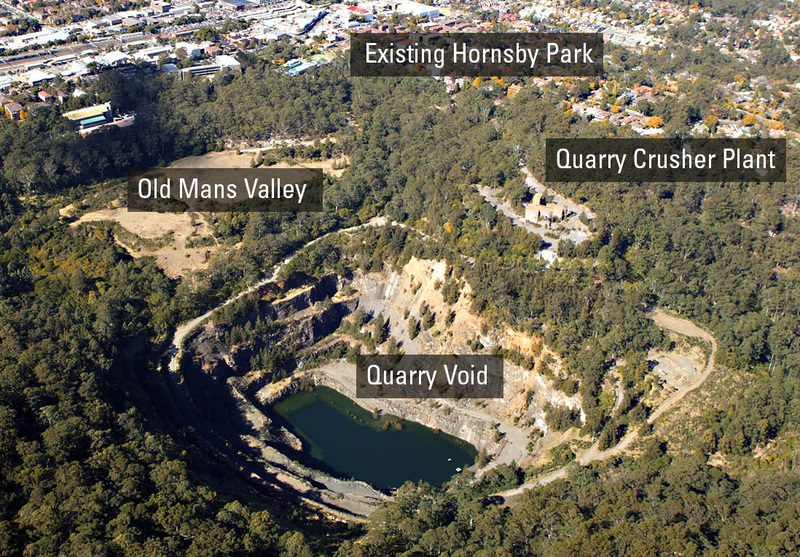 The Hornsby Park site comprises 59 hectares of bushland and open space surrounding an old rock quarry. Remnant buildings of the quarry crushing plant can still be found at the end of Quarry Road, perched above the quarry void. To the east of the quarry is Old Mans Valley which has a mix of cleared and bushland areas that are currently used for mountain bike riding. Hornsby Park is also home to Hornsby Aquatic and Leisure Centre, a children’s playground and formal gardens. Each of these areas has its own distinct features that make them suitable for a wide range of activities. Hornsby Park comprises a number of features of historical interest including the State Heritage listed Old Mans Valley Cemetery and early settler relics. These will be preserved in the development of Hornsby Park, linking its history to its exciting future. Click on the map to the right or scroll down this page to find out more about each area. Featuring dramatic level changes, exposed rock walls and an open water body, the quarry void is the centrepiece of the parklands. Abandoned buildings that once processed material extracted from the quarry site are located on a flat area at the end of Quarry Road. Old Mans Valley sits in a well-defined natural valley between Hornsby Quarry and Peats Ferry Road. The heritage-listed park is home to Hornsby Aquatic and Leisure Centre, a children’s playground and formal gardens.